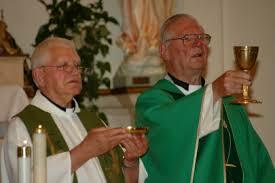 Monsignor PIck (on right ), rest in peace. Please pray for the repose of the soul of Monsignor Ambrose Pick, pastor of Saint Hedwig’s church from 1978-2002 (but was a priest for many years before that), after which he enjoyed a quasi-retirement, but would joke that he was working harder than ever. Monsignor Pick was a great friend to Our Lady Seat of Wisdom Academy in its earliest years, and the college owes him a great deal of gratitude, as do so many in Barry’s Bay and beyond. May you enjoy a blessed eternity, Monsignor, and may we all meet again merrily in heaven!